We recently did a workshop about in-season arm care for the baseball player. Taking that we wanted to focus on the shoulder and give you a handful of things you should know when training the shoulder. A lot of this comes from a previous shoulder article that I had written. What to know about the shoulder. These things should be on your mind when doing rehab, accessory work, maintenance care or just shoulder strengthening in general. Each of these things should be considered in order to help maintain healthy resilient shoulders. The shoulder is made up of multiple joints. 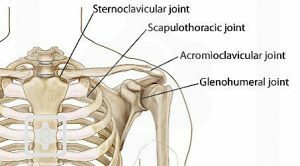 The glenohumeral joint, or shoulder joint as most people think of it,is more like a ball on a tee then a ball in the socket. This means you need to maintain a lot of stability at the joint for healthy movement. The Rotator Cuff (RTC) provides a lot of the dynamic stability to the shoulder to help keep it on the socket. While the name “Rotator” implies that these muscles rotate, the main function is to keep the ball in the socket. RTC training is imperative to help reduce injuries and rehab injuries to the shoulder. This is especially important if you are performing repeated overhead work! You cannot talk about the shoulder without addressing the shoulder blade. The shoulder blade and its accompanying musculature are the foundation for your shoulder and provide an anchor for the arm as it moves. There are numerous muscles that attach at the shoulder blade. These muscles need to have proper strength and mobility in order to maintain healthy movement of the entire complex. Get “warmed up” before doing any big movements. Initiating use of our rotator cuff and shoulder blade muscles tells your brain to have these muscles ready to go. Performing accessory exercises (more focused movements) before doing your big and/or fast moves can help keep your shoulders healthy. Your thoracic spine and rib cage play a big role in how you use your shoulders. When you reach up, back or out to the side your thoracic spine should be moving with your shoulders. If it doesn’t then your shoulders will be doing a lot more work. Keeping a mobile thoracic spine will help maintain shoulder health. Take a look at the picture here. A rounded position in the thoracic spine with the inability to extend can limit the range of motion in the shoulder. If you are able to extend through the thoracic spine your shoulder motion is not only greater, but there is less burden on the shoulders to reach up and back if the thoracic spine can help get the shoulders in a better position. Understand your end ranges of motion and be sure to work into your end ranges. This should start off very light as your shoulders are more vulnerable in these positions. When you have strength in these ranges and can use them effectively your shoulders will be able to accommodate and/or react when they get put in difficult positions. Make sure you understand the intention of your exercises. Certain shoulder exercises can be difficult to maintain the proper technique and use of the correct muscles. Prone I’s, Y’s and T’s are generally designed to make sure you’re engaging the scapular muscles. Shoulder External rotation needs to make sure you’re spinning through the shoulder and not arching the back or packing the shoulder blade down with your lats. So, make sure when you are performing an exercise you know why you’re doing it. These are some basic points to consider when training the shoulders. Check out our free shoulder give-a-way Starting With Your Shoulders for some more information on maintaining stability and some basic exercises to start you in the right direction. Also, be sure to check out our Instagram @suarezSOPT or Suarez Sports and Orthopedic Physical Therapy on Facebook for more information and ideas on shoulder exercises.